Hoppe sets the praxeological view (economics as a purely deductive science) against positivism, while taking the critics of the Austrian approach head on. 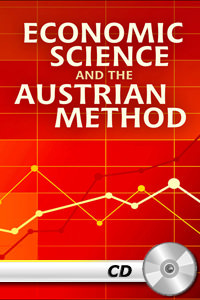 Hans-Hermann Hoppe rests his argument on the Kantian idea of the "synthetic apriori" proposition, thereby expanding an aim of Mises's in the methodology section of Human Action. Hoppe is the Austrian School's most prominent methodologist, and here he is in top form. He combines a rigorous scientific explanation with fantastic passion and rhetoric. These lectures astonished students at the Mises University when they were first delivered. They were later turned into this monograph, which has been a staple of Austrian pedagogy ever since.